Anyway. 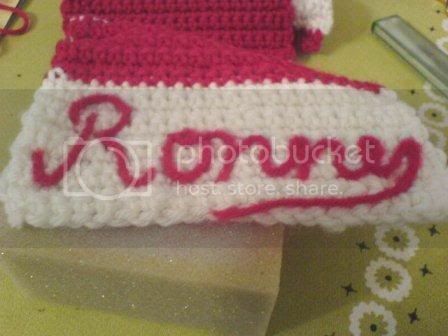 I crocheted it in a stripe pattern that is completely made up along the way. The only thing I was worried about was getting the ratio of colours as similar to their uniforms as possible. Admittedly I have not measured it, but I'd say it is at least 5 feet long. I used Cleckheaton Country 12 ply, that is 100% Aussie wool. I think I went through about 5 50g balls of white, 3 of red and half a ball of black. I really dragged my feet turning in the ends, so it took a few weeks but then the fun part came last and took me all of about 45 minutes. I needle felted his name on one end with scrap yarn. I am proud of this as it is my first attempt at this sort of thing. Not bad for a first attempt, and by someone with poor handwriting in the first place. I know he will love it. Seems odd that a grown man would like to wear stuff with his name on it? But his pet peeve is people calling him Ron or Ronald. 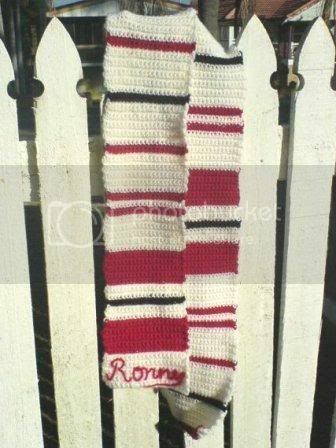 So fixing 'Ronny' permanently to his scarf is just the sort of embellishment he'd have ordered up himself, if he'd thought of it.